Love DIY wreath making but don’t want to have to store a million wreaths to change them out every season? 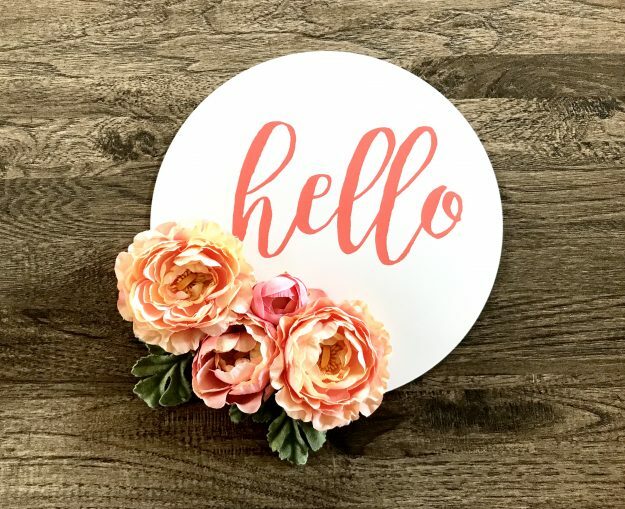 This easy project can be made in minutes – and changed up in a snap so you can have a fresh look every season without the hassle of storing tons of different wreaths (because… let’s face it… they can take up a LOT Of room! I’ll show you how to make this DIY wreath in minutes! 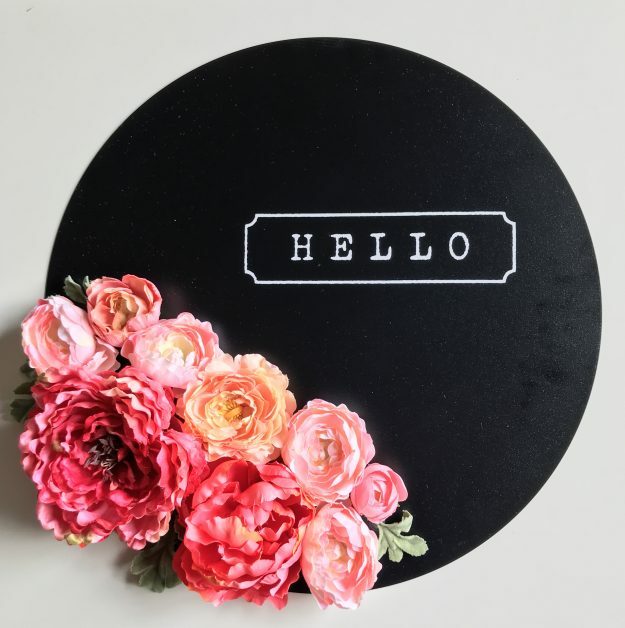 I’ve shared my love of Chalk Couture many times before, and also my love of pretty, yet simple, craft ideas that look like high end decor, but on a lazy girl kinda scale. This wreath definitely fits the bill in both categories, and I’ll show you how I literally made it in minutes! Using wire cutters, cut the flowers off the stems as close to the bud as possible. Cut off some leaves, too, for greenery. Apply hot glue to the back of the flower then place a small magnet to adhere it to the floral pieces. Set aside to dry. Add the design to your wreath by applying a Chalk Transfer, then squeegee the paste onto your design, peel off the transfer to reveal your design. Clean transfer and squeegee with Clorox wipes and let air dry before putting away. To change out the design, clean the magnetic chalkboard with a wet cloth and let dry. Apply new design, switch out flowers and you have a whole new wreath! I just love and love how you make crafts and great ideas! I have an extra round black chalkboard sign that I’m going to use to make one of these. Thanks so much for the great idea! That is awesome Denise, have fun!! You are really talented. I can’t do such things so fast 🙂 My daughter loves such crafts, she is always doing origami, posters and some cute decor for her room. I think she will be happy to make this one too. Thank you for the cool idea! It is my pleasure Ashley!